Serves: 1 sausage whorl per person. Cook on a preheated barbecue or under a preheated grill for 12-15 minutes turning frequently. Alternatively cook in a preheated oven at 190ºC, gas mark 5, for about 25 minutes. Make sure the juices run clear and there is no pink meat when cooked. 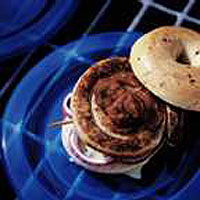 Split and toast a plain or onion bagel, then top with melted cheese and red onion rings. Spoon some Waitrose Salsa Relish into the centre of the bagel just before serving with the sausage whorl.